While world population increased 72 percent between 1970 and 2004, extraction of construction materials grew by 106 percent. 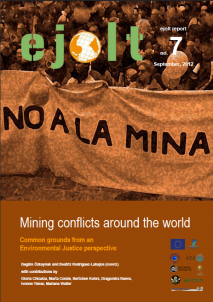 Going beyond the buzz about decoupling the economy from natural resources use, this paper explores mining conflicts at the crossroads of de-growth and environmental justice movements. We document 24 real case studies from 18 different countries. The report has factsheets and 4 in-depth cases. Modern economies require mining resources. But decisions on what and how much, where and how mining takes place must not be made without the consent or even against the will of those affected. Similarly, monitoring, restoration and compensation plans require prior informed consent. For detailed policy recommendations, have a look at the briefing.